Coaching is no longer simply or primarily an inquiry about how to “get ahead” or acquire new skill. It is an opportunity to explore deeper personal values and patterns of being. For many, it is the one professional context where they are invited to speak candidly about what is not seen and cannot be measured. It is a conversation for awakening to and inhabiting qualities of self that will allow greater aliveness, productivity and joy. 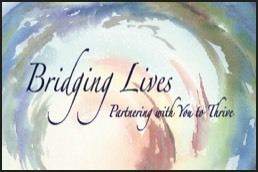 Welcome to Bridging Lives Notes. I like the idea of notes. Notes are little messages. They are also the components of music. They can catalyze new perspectives and resonance. These days I'm especially curious about our power to create, composing new music together, if you like. This power evolves as we do. My new program, Woman Alive!, is an inquiry about empowered leadership for women. Does that interest you? He could foresee ripple effects of a new “no” on people related to him who had shaped their lives around what had been a “yes.” For my friend, the new “yes” was compelling, opening his heart, body, mind and vision in ways he had never experienced before. Even so, at the crossroads, he felt torn, conflicted and uncertain about how to navigate the transition honorably, responsibly, and with kindness not just for others but also for himself. For someone accustomed to being in the lead and valued for decisive action, being at the crossroads can be unsettling and tender. It’s a time of collecting oneself while also letting go. Letting go makes space for what’s alive and wanting to emerge now. Letting go of hard-earned identity and reinterpreting what is meaningful can be easier said than done. At the crossroads we sang. First we sang to the virtues of the self he was right then, the identity he had outgrown. We showered that self with sincere appreciation and honored his good name and truly good works. Doing this had never occurred to my friend; he knew to “soldier on,” focused on making the next thing happen. Singing the virtues of who he had been completely took him by surprise. When the tears stopped and breathing softened again, we sang a new song. This was a song for welcoming more than a new era: it was a song welcoming his Emergent Self. With greater clarity and joy, we sang for embodied courage and to celebrate his choice to be fully alive and fully present for what was next on his unique, unfolding journey. At the crossroads that day we listened more deeply and gave voice to something essential for letting go while also stepping forward. It was an instance of shared creativity and compassionate mindfulness. My friend remembers that day as a turning point, a bridging moment. His power to create is strong. Pause, breathe and notice. Are you at a crossroads? To the self you have outgrown, what is your Song of Virtues? To your Emergent Self, what is your Song of Courage and Welcome? Kindly sing yourself into being again. Here’s something else about being at a crossroads. Where are you with this? Crossroads: Labor Pains of a New Worldview. How can we encourage creative tension and not be derailed by it? What can make collaboration more enjoyable and productive? A-A-A. Three essential building blocks for a positive collaboration culture are: Appreciation, Agreements and Accountability. A-A-A is at the top of my list because together they build trust and allow for creative synergy. There’s a saying that “what you appreciate, appreciates.” It grows in value and impact. So, appreciation is not simply the gesture of acknowledging what you like. It is directing your attention to what needs to appreciate in collaboration, namely the commitment to play at your best. When people are task-focused and under pressure, sincere expression of appreciation can quickly fall away. That can seem trivial, but consider the importance of social threat and reward. According to brain science, the organizing principle of the human brain to diminish social threat and increase social reward. When sincere, appreciation sustains an atmosphere of social reward. It helps people orient with a more resilient attitude of openness and possibility, especially under adverse circumstances. Quick true story: Two colleagues are working together. They basically like each other but have very different working styles and communication needs. After several failed attempts to resolve a disagreement, they reach an impasse. The first one to “come to” steps back to get perspective and try again. Still steamed and righteous, she decides to focus on something about her colleague that she likes. Something small, seemingly irrelevant (or even laughable) and tangible. (For example, the sound of his laugh when he’s truly amused.) She asks herself, “What do I value about that?” When she really feels the sense of appreciation, she asks herself, “Ok, what else do I appreciate about this person?” And so it goes until she can appreciate something about his point of view and enter the conversation again with curiosity grounded in appreciation. Their communication dynamic shifts; they work through the impasse. How conscious and deliberate are you about having clear agreements? Generally, people working together set a structure of some explicit agreements and then “wing it” until there’s a breakdown. How often have you been bitten from assuming that someone had the same “common sense” or assumptions or needs about something that you do? I consistently encounter teams trying to be productive without an agreement for how to address and resolve differences constructively. Sometimes they’re working hell-bent to accomplish different – and possibly mutually exclusive – goals, without realizing it. The fabric of their agreements is full of holes because the stuff they haven’t agreed about yet is the stuff they can’t even talk about…yet. In fact, the tacit agreement will be to conform to what seems to be the norm and just keep busy. In a rush to produce results, agreements about standards, feedback, dealing with resistance and getting alignment might be given only a nod in passing. Why do we avoid accountability? Could it be that “being held accountable” too often is the same as being the one blamed or the “fall guy?” On the other hand, why do we want accountability? From a positive perspective, we value the ability to measure progress. We also value boundaries: this is mine to take care of, and that is yours to take care of. Because we create action with language, it matters how we use words like “yes” and “no.” What can I/we count on you for? Few things undermine collaboration as much as accountability slippage that is not corrected. It’s like a leak in a fish aquarium. Breakdowns in accountability tend to register like breakdowns or betrayals of trust. The accumulation of many small, seemingly insignificant instances of accountability breakdowns can be more damaging that one big one. The big one you can name and deal with directly. The collection of little ones is tougher to name and address. Rather than being a way to assign blame, accountability, for a culture of collaboration, is a practice for creating resilience. You win some, you lose some, but you account for your role and what is yours to take care of. This strengthens coordinated action and trust. A closing note: Beware of the other “A” that functions like a poison pill. Avoidance. When we began working together, this vibrant young leader was a successful Strategy Consultant with BluSky Consulting. She chose coaching at a time of opportunity, not challenge. Nothing was necessarily wrong or missing. It was a strategic move for increasing her effectiveness as she purposefully stepped forward. What took her by surprise was the treasure within that she uncovered by slowing down, listening for and claiming aspects of herself that would open possibilities she had not yet dreamed of. Today, Diana Rothschild is the Founder and Chief Mom of NextKids. Her commitment to sustainable business endures and has evolved. Now she is directing it toward families and working parents. Hear Diana share about NextKids and why she feels called to lead there. Her insights may help and inspire you, too.